Today, people walk hand-in-hand with technology to keep themselves away from a tag like an ‘outdated’ person. Do you like to be called old-fashioned? Ugh, no one likes! So, here I come up to share a jaw-dropping experience of a visualizing architecture to help you step further into a techno-world. A very first question pops up into your mind would be, what is 3D rendering? And you might be keen to know about 3d rendering services. Right? Anyway! 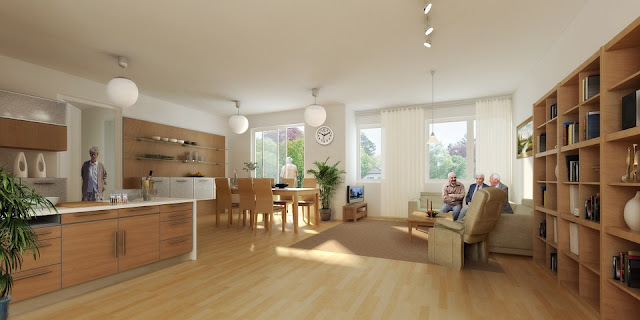 As per definition, 3D rendering is the 3D computer graphics process to convert 3D wire frame models into 2D images on a computer. And according to a basic term, it is a two-dimensional representation of a wireframe model which gives properties such as colour, texture, and material. However, you see & experienced 3D renderings every day, but most probably you don’t notice. At least to some degree, the 3D digital artwork is everywhere starting from your newspaper or magazines to your Television screen it is everywhere like a goodness. The technology amazes you by converting your sketches into a realistic visual which can simply grab all your client’s attention. Impressive! 3D visualization is based on two software pillars which are modellers and renderers. Every rendering starts as a 3D model (a sequence of flat geometric shapes that connected together in three dimensions which are called polygons). Hence, these geometries are the backbone of any digital 3D model and are developed using computer software like AutoCAD, Google SketchUp, Rhinoceros 3D and much more available on the internet. Moreover, there is also software like Photoshop which has an ability to give each task a final magical touch which makes rendering to be a marvellous experience. A 3D rendering art worker must be comfortable with a variety of software to create a high-quality visualization. Can 3D rendering technology become the next boom? Well…well! It’s difficult to predict whether it takes over the techno-world or not. But yes, in the nearest future computers will get more faster, processors will get smaller and more & more people will have access to the tools needed to be a 3D rendering artists which can take it to the next level. A profession will grow as the demand for 3d rendering services increase day after day. Although scientists and engineers poured their blood, sweat, and tears into opening up quantum computing if it will be successful then we can see the world from a different perspective. This drastic change in the techno-hub will not only beneficial to industries, but it will also work effectively in medical applications, automotive industries, and military applications. Visualizing architecture and 3D rendering will shortly take over the best technology crown in the developed world, and artists will need to satisfy software or machine worth by creative totally different views. Now visit our website 3dpraxisstudio.com where you can feel an amazing visualizing architecture whether you are techie or non-techie. Contact us for 3d rendering services. We deliver breathtaking architectural rendering experience. Let’s turn your dreams into reality. Source: Why Does Designer Use 3D Architectural Rendering Services? - Know All The Facts!